Properties in Neukirchen average 4.7 out of 5 stars. Property 11: Reethüs - Frisian cozy. Property 21: A thatched semi-detached house with parking space for up to 2 cars. 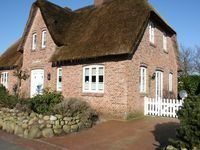 Property 28: 3 km from the Wadden Sea, pets ok, friendly. We thoroughly enjoyed our stay here. All amenities needed are available. Everything was modern and very clean. Surrounded by quaint towns and beautiful areas to explore. Swimming in the North Sea at the Danish island, Romo (45 mins. drive) is loads of fun. The landlord was very nice and accommodating! Dieses Ferienh&auml;uschen ist ein Knaller. Es ist wundersch&ouml;n und &auml;u&szlig;erst gem&uuml;tlich eingerichtet. Der Garten ist klein aber fein. Alles ist sehr gepflegt. Wir haben uns einfach nur wohlgef&uuml;hlt.